1 GRAND PRIZE: 2 airline vouchers and 1 $500 Waffle House gift card for winner. Approximate Retail Value ("ARV"): $1,300. 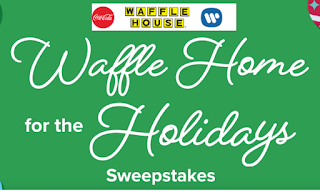 Additionally, winner will be contacted by phone at the phone number provided on the registration form and asked to identify his/her favorite Waffle House associate and that associate will be the potential winner of 2 airlines vouchers. ARV: $800. 10 FIRST PRIZES: William Michael Morgan Holiday Gift Package, consisting of 1 clothing item, 1 insulated beverage sleeve, 1 signed CD and 1 $50 Waffle House gift card. ARV: $200. 10 SECOND PRIZES: 30" Plush Polar Bear with Knitted Scarf. ARV: $38.50. 40 THIRD PRIZES: $25 ShareACoke.com gift code. ARV: $25.00. 35 FOURTH PRIZES: 5 free waffles Waffle House coupons. ARV: $17.50. 400 FIFTH PRIZES: 4" Plush Polar Bear with Knitted Scarf. ARV: $5. 42 SIXTH PRIZES: 5 TouchTunes digital Credits. ARV: $2.50.